Brand new indoor festival, LOST! 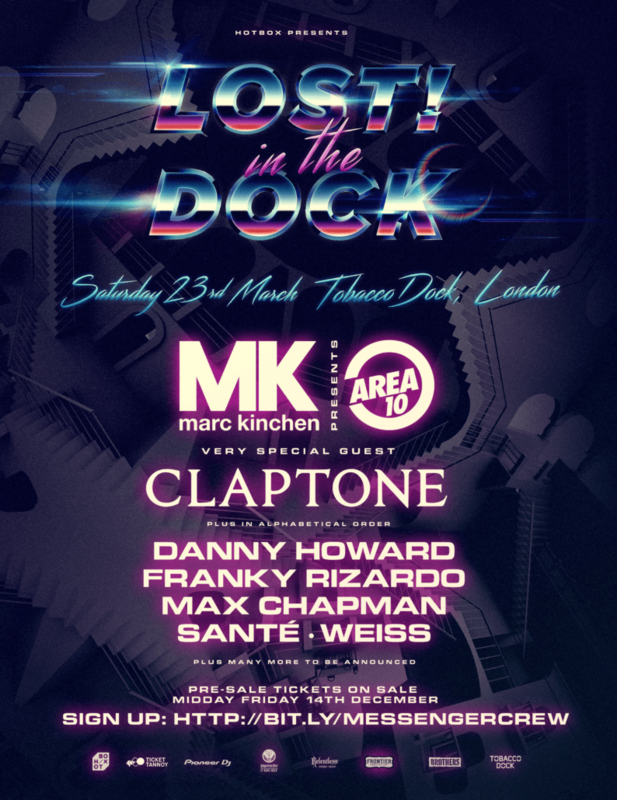 in the Dock is set to touch down at London’s renowned Tobacco Dock venue on Saturday 23rd March. A partnership between LWE and event brand HotBox, the all-day party will be spearheaded by a flurry of dance music’s biggest names which include MK, Danny Howard, Claptone and many more. Having previously hosted a series of events at several locations across the capital including Boxpark Croydon, LOST! in the Dock marks Hotbox’s debut at the iconic location which is set to take place from midday til 10.30pm. With Detroit house legend MK topping the phase one line-up announcement, the ‘17’ producer will bring his hugely popular ‘Area 10’ brand with him, with the party series previously selling out events at the likes of Miami Music Week and hosting its own stage at Creamfields. With special guest Claptone also in attendance, the star-studded cast is topped with appearances from BBC Radio 1 broadcaster and DJ, Danny Howard, and DEFECTED fan favourite, Franky Rizardo. With Cocoon regular Santé also scheduled to play the Tobacco Dock event, the Berlin-based producer is joined by Max Chapman, and emerging talent Weiss – whose summer single ‘Feel My Needs’ (almost 7 million Spotify streams) cemented a place as the ultimate Ibiza anthem for 2018. Pioneers of the now hugely popular day-party format, the Tobacco Dock team have welcomed a number of incredible parties to the venue in the past five years, raising the bar with a cutting-edge selection of FX at the unique Grade I listed venue. Party goers can now exclusively access pre-sale tickets by joining the Messenger collective at http://bit.ly/MessengerCrew.